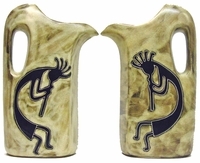 In this category of Kokopelli, Mara captures this unique ancient character. 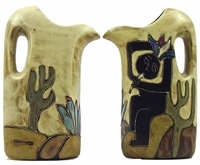 Mainly depicted as a hunch back flute player. 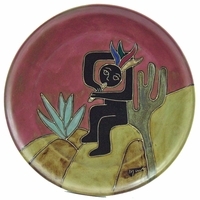 Mara has placed Kokopelli on her stoneware mugs, serving platter, on a uniquely designed curved stoneware pitcher, decanters, tiles, and on a stoneware stein.